Many data centers unwittingly have a blind spot in their backup strategy, endpoints like laptops and other devices are left exposed. Most organizations have no formal endpoint data protection strategy even though studies indicate that over 60% of data on endpoints is unique to that device. In most cases, there is no centralized data protection strategy for endpoints. IT is counting on users to protect their data, but the reality is that the organization needs a centralized endpoint data protection strategy that fixes backup's blind spot. 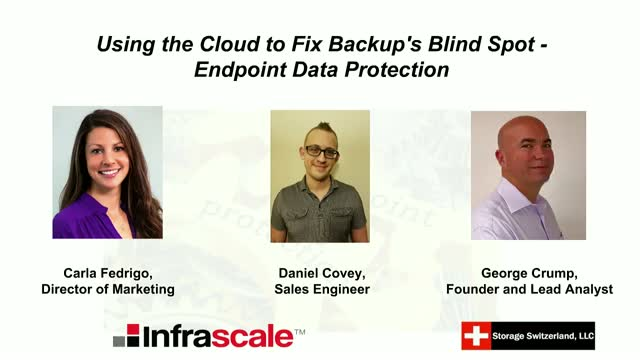 Join Storage Switzerland and Infrascale for a live webinar to learn how to create an endpoint data protection strategy that leverages the cloud to fix the backup blind spot. The webinar also includes a live demo of the solution, so you can see how efficiently IT can protect endpoints without disrupting end users.